"[The Movie Hub] can give [young people] choices in their life. They will have a variety. It can also bring fun. " "It can inspire them to take on bigger stuff in life". "...at school it's a tiny bit boring but at Movie Hub you're enjoying yourself but learning at the same time". "It made me realise that I can be what I want if I try". "[The Movie Hub] can move [young people] to their next step in life which is to look/search/think what they want to be when they grow up". "I will put my hand up more often now in class". "It's built up my confidence speaking to a group". "I learnt that you have to listen to other people". What, if anything, have the workshops taught you about getting a job or being good at a job? "To work hard and believe in yourself". "That there is no easy shortcuts [sic] ". "You have to be patient with some things and remember all people are important and had a role with the finished product"
"Taught me a huge variety of jobs in the workplace". "Work hard and don't stop and practice talents". 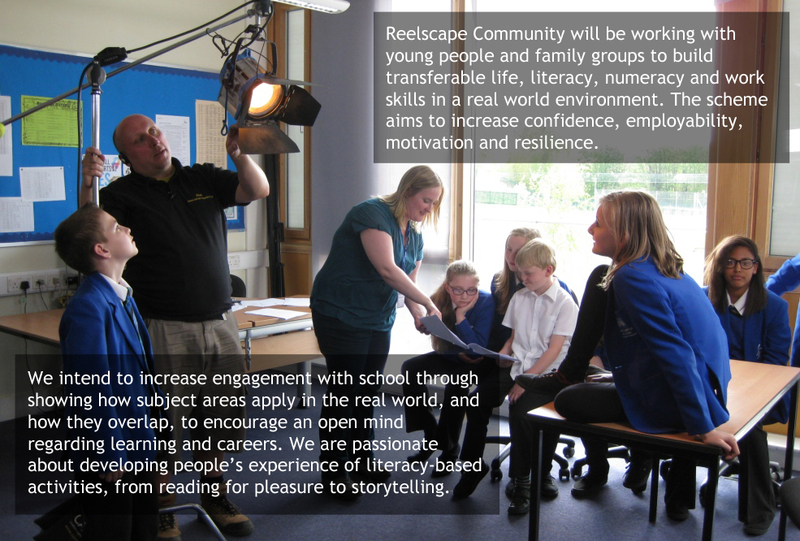 The scheme has featured in the Chronicle & Echo, on BBC Radio totalling over 50 minutes of coverage, in Northants' Business Times and Chamber of Commerce In-Business magazine, on the 6pm ITV Anglia News and will appear in the Youth Library Review written by the Youth Libraries Group. Our various events have been attended by local MP Michael Ellis, Leader of the Borough Council David Mackintosh, Lord Lieutenant of Northamptonshire David Laing, John Griff BBC Radio Northampton, Northamptonshire Enterprise Partnership, Royal & Derngate, Chair of the County Council Joan Kirkbirde, Greencore, University of Northampton, Anne Burnett the High Sherriff and Helen Boardman Director of Office of Faith Based & Community Initiatives Northamptonshire Police and Crime Commission. The workshops will contribute towards Fortune Cookies, a cross-cultural family comedy about a young girl struggling to balance her father's desire to give her a traditional Chinese upbringing with her own ambition of becoming an actress. The film is headed by female duo Producer Becky Adams of Northants-based Reelscape Films and Writer/Director Brenda Lee. With a strong lead female character, its regional production and a cultural context not often represented in mainstream media, Fortune Cookies is a truly unique project set to star Fiona Rene as Susan Lee, with Les Dennis, Pik-Sen Lim, Liz Sutherland, Daniel York, Meline Danielewicz, Ozzie Yue and Jenny Bede. Will Susan Lee turn down her dream stage debut to save the family takeaway from repossession by appearing with her cringe-worthy family on national television on their favourite TV game show? The film raises some interesting and pertinent questions for the workshops' young people about family duty, stereotypes, culture and debt, which they'll discuss across sectors of the community and within our family group workshops. "Family vs Ambition. Love vs Duty. Fame vs Fried Rice?!"